Reinforcement is defined by its effect on behavior. Specifically, a reinforcer is any stimulus that increases the frequency or probability of a behavior it follows. This is called a functional definition, because the term is defined by an outcome: a purpose (function) that is accomplished. We ran into another functional definition on the last page: the definition of operant as any one of "class of behaviors" that achieves a particular effect on the environment. Similarly, a reinforcer is defined by how it works or functions. If a stimulus increases the frequency of a behavior it follows, then the stimulus is a reinforcer, by definition. What is the functional definition of reinforcement? How do you know if something is a reinforcer? One can usually make an educated guess about what reinforcers will work with animals. Praise works well with pet dogs. Food usually works with hungry animals. But one never knows for sure what effect a stimulus will have upon a complex creature like a rat or human. One cannot tell if a stimulus will be a reinforcer until it is actually used and the effects are observed. If a stimulus increases the frequency or probability of a behavior it follows, then it is a reinforcer, by definition. This is true even if the stimulus does not seem like it should be a reinforcer. The functional definition of reinforce­ment turns out to be important, because it helps us locate both (a) rewards intended as reinforcers that don't actually work like a reinforcer, and (b) stimuli not intended as a reinforcer that nevertheless act like reinforcers. The word positive in positive reinforcement does not refer to the pleasantness of the stimulus. It means a stimulus is added or applied to the situation. Any stimulus that works to increase the frequency of a behavior it follows is a positive reinforcer. This is true even if the stimulus does not seem like it should be rewarding. The idea of defining reinforcement and punishment by their effects is one of the most valuable insights from operant conditioning. It can give you an edge in analyzing certain situations. When you see a behavior get more frequent, you look for the stimulus that follows that behavior, then assume that stimulus is a reinforcer. This can allow you to identify some weird reinforcers. Inadvertent reinforcers can establish troublesome behavior patterns, because people do not realizing they are reinforcing something. See, for example, the later section on the punishment trap that occurs when parents ignore children and only pay attention to bad behavior. Similarly, a stimulus intended as a reinforcer may not function as a reinforcer. One must measure results before deciding. If a stimulus actually has the effect of reducing the frequency of the behavior it follows, then it is a punisher, not a reinforcer. Praising a student in class for raising a hand and offering an answer is probably intended as reinforcement. The teacher wants more of that behavior. But if the student never again raises a hand in that class, then (in effect) the student was punished by this attention. Psychologists commonly distinguish between primary and secondary reinforcers. Primary reinforcers are unlearned. They are based on some biological drive or need, such as the need for food, water, attention, or a comfortable temperature. Secondary reinforcers, by contrast, are learned or symbolic reinforcers. They have value because they can be used to obtain other reinforcers or have been associated with other reinforcers. Money is a secondary reinforcer. You cannot eat or drink money or satisfy any biological need with it, but you can exchange it for other things that do satisfy basic needs. Grades are secondary reinforcers. They are worthless in themselves, but they provide a means to obtain other reinforcers like pride and fruits of employment after graduation. What are primary and secondary reinforcers? What are examples of each? How do you find a reinforcer that will "work" with a particular individual? One technique is to observe what the individual chooses to do voluntarily. As a rule, preferred behaviors can be used to reinforce unpreferred behaviors. This is called the Premack principle after psychologist David Premack, who pointed out the pattern. A formal statement of the Premack principle is as follows: high-probability behaviors (those performed frequently under conditions of free choice) can be used to reinforce low-probability behaviors. What is the Premack principle? If a rat likes to run on a wheel, you can reinforce a bar-press by allowing it to run on its wheel only after a bar-press. 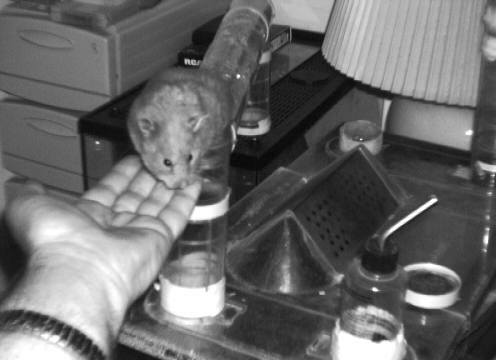 If you have a hamster that always wants to escape from its cage, then you can reinforce the behavior of climbing onto your hand (non-preferred) by offering your hand as a way to escape from the cage (preferred). This actually works, as shown by the picture below. Weester (the hamster) was reluctant to be held, but if my hand was the ticket to freedom, he would climb on it willingly. Eventually we became pals. Parents sometimes use a variation of the Premack principle. If they want children to eat vegetables (sometimes a non-preferred behavior) they can make a rule that vegetables must be consumed before the children get to eat a dessert (usually a preferred behavior). Similarly, children may be asked to do their homework (sometimes a non-preferred behavior) before watching TV or playing video games (usually a preferred behavior). A general label for arranging conse­quences to produce desired behavior is contingency management. In an influential 1968 book, Behavior Modification: Theory and Practice, Albert Bandura rallied evidence for a set of learning techniques that went beyond traditional Skinnerian procedures. Bandura emphasized the importance of learning through observation. This occurs when one animal learns by observing and imitating another animal. Modeling is one form of obser­vational learning. It occurs when one animal performs a behavior, while others look on and learn from it. Primates are particularly good at observational learning. Young chimps have been observed watching a parent fish for termites using a twig, then performing the act themselves. Non-primate species show observational learning in special situations. Lion cubs learn to hunt by watching from a concealed location as adult lions hunt. Parrots are also good at imitating. Modeling is used in the rival mate technique for training parrots. If a trainer wants an adult male parrot to perform tricks, the bird is allowed to watch a rival male show off in front of a female. The untrained parrot will then imitate many of the tricks with no special training. What is observational learning? Modeling? Bandura discussed a basis for obser­vational learning: vicarious reinforce­ment. Something is experienced vicariously if it happens to somebody else but you react as if it was your own experience. Crying at a sad movie is an example of vicarious sadness. Vicarious reinforcement occurs if (as in the rival mate technique) one creature observes another suc­ceeding at obtaining reinforcement. This may cause the observer to act as if it was the one who was reinforced, imitating the behavior. Vicarious reinforcement occurs in the wild when many animal species visit a watering hole in a dry environment. Animals watch each other and, when one takes a drink, others join in. Observational learning can involve safety signals (signals that a threat is not forthcoming). For example, a naturalist who was studying wild turkeys raised a batch of the birds from egg to adulthood. The turkeys were allowed to run wild, but they allowed the naturalist to remain in their midst, because they grew up around him and were habit­uated to him. This worked well for over a year, permitting detailed observations of the turkeys in the wild, until some of the male turkeys became aggressive toward him as if he were a competing male. During the time when he was accepted in the middle of the wild turkey group, the naturalist found to his sur­prise that deer would come right up to him. Evidently, when a group of wild turkeys acts calm, that is a safety signal to deer. Negative reinforcement occurs when a behavior is reinforced by removal of a stimulus. The word negative does not mean unpleasant in this context. It means a stimulus is removed or subtracted from the situation as a form of reinforcement. What is negative reinforcement? What does the word "negative" refer to? Negative reinforcement is said to be the most misunderstood concept in psychology. Students commonly assume the word negative refers to something unpleasant. They conclude that negative reinforcement is the same thing as punishment. But negative reinforcement is not punishment. Negative reinforcement is a form of reinforcement. It increases the frequency or probability of a behavior by "taking away something bad." For example, people go to the dentist to take away the pain of a toothache. A colleague (Dr. Gary McClure) sug­gested students should think of arith­metic. Positive means something is added, while negative means something is taken away. Negative reinforcement is the type of reinforcement in which something is taken away. Here is a simple example of negative reinforcement. Suppose you were taking a college course and the teacher said you could skip the final exam if you studied an extra chapter and took a quiz. You might study the extra chapter and take the quiz (your studying behavior would be made more frequent). The motivation would be to remove an unpleasant stimulus (avoid the final exam). That would be negative reinforcement.